The first °CEO Hangzhou MICE Fam Trip was successfully hosted by Business Events Hangzhou between April 24 and 26, 2017. 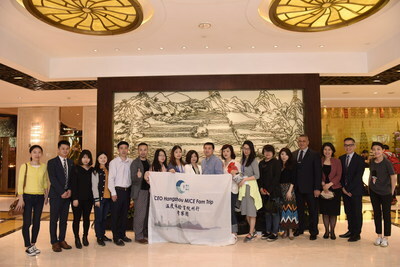 The dozen company heads, leading conference organizers and media professionals who were invited to attend the event, were given a tour along a route that is representative of what it feels like to °CEO Hangzhou MICE Fam Trip. The stops along the way during the °CEO Hangzhou MICE Fam Trip included high-end hotels, premium restaurants, distinctive venues and cultural experience programs, allowing the invited guests to get a real feel for what Hangzhou has to offer in terms of an international conference destination. As the annual theme of the Hangzhou’s MICE industry, the concept of °C (temperature) is reflected in all the elements that are the components of that industry, including those elements that were visible and tangible as well as those that are not. First and foremost, it’s the °C (temperature) of the city: Hangzhou’s hallmark is its strong appeal of the unique landscape combined with the local customs that are characteristic of the region. All of this comes together to create an elegant yet friendly and comfortable environment for businessmen once they have finished their meetings for the day or for travelers taking advantage of the incentive trip they have earned. Second, the °C (temperature) of the industry: the overall quality of practitioners in the city’s MICE sector has further improved over the recent few years and serves as a virtual circle. Third and finally, the °C (temperature) of the services: service providers across the MICE industry chain are committed to providing personalized and customer-centric services. Since the G20 Summit, awareness of Hangzhou globally has increased remarkably, with the MICE sector having experienced a spurt in growth. The rapid development of the sector has had a positive impact on the city’s economy and highlighted the city’s competitiveness, which, in turn, will further drive Hangzhou’s economic development and speed up the pace at which Hangzhou is becoming an international gateway destination. According to a director at the Business Events Hangzhou, the city is scheduled to host major international conferences and sporting events, among them, the United Cities and Local Governments (UCLG) 2017 World Council and the 19th Asian Games. During this key period between the G20 Summit and the 2022 Asian Games, Hangzhou’s MICE industry plans to take advantage of every opportunity to continue transforming Hangzhou into an international gateway city as well as one of the world’s top MICE destinations.